There are thousands of great WordPress themes out there, but finding one that’s perfect always seems to be a challenge. When searching for a theme, I expect it to be responsive for mobile and tablet, SEO friendly, fast, and easy to modify. While some free WordPress themes do all of this, most don’t. I’ve found that it usually pays off to invest in a good premium theme. Here’s an exhaustive list of the best premium responsive WordPress themes available. All of them are fully responsive for mobile and tablet. Mist is one of the most popular and highest-rated WordPress themes of the past 12 months. With over 50 demos, it’s easy to customise for virtually any niche or industry. It includes everything you’d expect, from sliders and mobile responsive templates to drag and drop visual editors. The Core is an incredibly flexible, intuitive theme. It allows you to easily create a beautiful looking site without touching a line of code with its visual builder. The Core theme by ThemeFuse comes with 18 prebuilt websites for specific industries including agencies, weddings, charities, lawyers and catering to get you started. Check out the 18 pre built websites offered with the theme to see how they can help you get your website up and running today. Total is one of the top selling WordPress themes on ThemeForest with over 18,000 sales. With a 4.8/5 star rating, it’s one of the best fully-customisable drag-and-drop WordPress themes I’ve come across. Spirit is a theme based on the ‘Upfront’ frame work, developed by one of the biggest names in WordPress: WPMU DEV. The Upfront frame work offers a drag and drop functionality with real-time updates, to see your edits as they are made. WPMU DEV package also comes with every plugin you will need to run a secure, safe and optimized website which I have used in the past to help create multiple websites for clients. Check out WPMU DEV to see how they can help you manage your WordPress websites. Monstroid is a multipurpose theme built on simple, accurately crafted Cherry framework 4. It is packed with everything you need for building websites easily like 50 Child themes designed for most popular business niches, 100+ layered PSD files to be edited in Photoshop, numerous shortcodes, modules, extensions and other practical features. Bellaina is an ideal theme for presenting a real estate company online. It gives you the possibility to add properties to your site and let your clients find exactly what they need. They will be able to filter the search results by required categories and see where the property is located on a map with preview markers. You can also allow your visitors leave property submissions by filling out a form and assign each of the submission to one of your agents. The theme was intended for modern professional business websites. MotoPress Slider, Background Video, TM Gallery, and Parallax Effect will help you tell the story of your company the memorable way and improve visitors’ experience onsite. You even don’t need technical skills to customize your resource as the theme is shipped with MotoPress Editor, allowing to manage page elements in the visual mode. Avada is one of the most popular premium WordPress themes. It’s a very clean theme with a full-width content slider and a neat layout structure. Unlike some of the more modern themes in this post, this one is a little bit less ‘out there’. GeoCraft V2 is a directory theme that’s fully-responsive and highly-customisable. If you’re thinking of creating a business directory site, this theme is ideal. FinTheme is a great theme for consultants and companies within the financial industry. Built by elite WordPress theme authors, ZozoThemes, this theme has everything you’d expect in a high-quality WordPress theme and more. A simple WordPress theme with three different templates and unlimited skins. The theme is powered by Pexeto Panel, making it a suitable platform for those with little coding knowledge. Modernize is a WooCommerce enabled theme with layer slider integration, boxed/full layout options, and a variety of blog layouts. inFocus is a fully responsive theme with over 100+ custom shortcodes, a short code generator, and great customisation functionality. The design is quite minimal, and has been built with SEO & speed performance in mind. Salient is another favourite of mine. This is probably one of the slickest WordPress themes with video background support. It’s WooCommerce ready, optimised for SEO, fast loading times, and has stunning icon design. Core Minimalist is what it says on the tin; a minimalistic responsive theme built around a photo gallery. The theme supports video portfolios, and includes both light and dark skins. InCreate is a responsive multipurpose theme with multi-language support (WPML), Woocommerce shop integration, Slider Revolution, 600+ Google Fonts, 700+ Vector Icons, and a variety of skins and layout options to choose from. Metronic is a frontend admin dashboard theme. I’ve used this theme before to build the UI for an email marketing service, and it’s a great starting place. It also has a corporate UI and eCommerce UI, both of which look very nice. Vertikal is a clean responsive design theme with 11 different pre-made skins and an easy-to-use drag and drop page builder. Bigbang is another WordPress theme designed with agencies in mind. It includes a clients pages, about us page, 6 portfolio post formats, 6 blog page layouts, and 6 different single post page layouts. Moose is a flat responsive and retina ready theme with parallax effects. It’s built with Twitter Bootstrap 3 and features 50+ HTML5 pages, WPML integration, Visual Composer, Revolution Slider, Fancybox, and much more. NetStudio is an attract theme that comes set up with Visual Composer, meaning you can change the design with touching a single line of code. Built with mobile first techniques, Mini is a great WordPress theme for corporate, creative, and eCommerce businesses looking to show off a portfolio. This theme runs extremely fast, thanks to the highly optimised code. ChurcHope is a WordPress theme designed for churches, although it can really be used for anything. It includes event countdowns, upcoming events listings, a calendar, and event details pages templates. Krypton is a beautiful theme that I’ve used as a template for several projects now. Everything about this theme has been designed with such attention to detail – from the loading of the HTML5 charts, to the user experience of the blog post summaries. Overall, I think this is probably one of the nicest themes around. SloWave is a flat design WordPress theme built on the Twitter Bootstrap framework, and includes Live Composer. Also included with SloWave is a one-page version of the theme. Qaween is a wedding WordPress theme with an RSVP form and countdown timer. The theme has over 500+ Google Web Fonts to choose from, and has a slideshow, events page, and photo gallery. Alyeska is retina enhanced and fully responsive. The theme is easily customisable and has a large range of layout and colour options to choose from. This theme also supports the Twitter Bootstrap icon set and Twitter API. Optimas is a cross browser compatible theme with a clean slider-based design. The theme comes with 26 different patterned background images, 12 pre-made theme skins, and many further options to customise the theme. The theme is also integrated with Mailchimp, and includes 16 fully layered PSD files. Barnelli is a premium WordPress theme dedicated to restaurants that need an impressive online presence and booking system. The theme is minimalistic, and includes three different menu designs. Centum is a minimalistic theme with both dark and light colour schemes. This one’s great for basic blogs and news sites. Website is a WordPress theme with lots of layout customisability, and includes 9 custom widgets, including Twitter Stream, Flickr Stream, Facebook Like Box, social media buttons, Contact form, Posts list, search, site info, and unwrapped text. Argus is a really slicker on page portfolio website suited for designers, photographers, illustrators, and creatives. The design is clean, focusing all of the attention on your work. Rebound is an ultra-responsive WordPress theme with parallax containers, LayerSlider, and 40+ customisable element animations. This theme also includes layered PSD files. Vida is a creative theme that includes two separate versions – a one page design, and a multi-page design. This theme includes 6 types of page templates, 20 shortcodes, and has lots of options for customising it. Cake is a beautiful WordPress theme with WooCommerce integration, SliderRevolution, WPML, and much more. It’s cross-browser compatible, and well optimised for SEO. Flatsome is a popular eCommerce WordPress theme with shopping cart integration, wish lists, product pages with tabs, and a custom checkout design. Callisto is a highly customisable premium WP theme that comes integrated with Visual Composer, WooCommerce, WPML, and much more, to make it simple to build a powerful and professional looking eCommerce store. Florida is a responsive and retina-ready WordPress theme with a strong focus on contents and readability. It’s a very simple design and includes both a magazine skin and a one page website skin. SmartMag is a modern WordPress Magazine theme with multiple blog layouts, suitable for magazines, newspapers, review sits, or blogs. One of the nice things with the SmartMag theme is the included review system, which enables readers (or the writer) to review content or products, and display the percentage / star ratings. NewsZone is a flat design theme with six homepage layouts and a clean (and unbranded) frontend UI that enables writers to add, mange and edit posts without going into the standard WordPress backend. This theme has three layout options, including a full width skin, a boxed skin, and a boxed skin with margins. Saalbi is a clean theme with WPML compatibility, Visual Composer, and LayerSlider installed. The theme supports video backgrounds, parallax scrolling, and is responsive and retina ready. I’ve used Newave on a few projects, and am a big fan. It’s a one page scrolling website theme with subtle use of parallax CSS. You can choose between a video background, full-width parallax slider, full screen slider, moving image background, or a full screen image parallax design. Faculty is an Ajax powered WordPress theme to promote your academic resume. Of course, there are many different applications of this design beyond the academic intent (I think it would make a great admin dashboard UI), but as a personal profile theme it’s slick and to the point. Angular is a responsive WordPress theme suitable for those who want to showcase a portfolio online. The theme also supports the bbPress forum plugin, in case you require a forum on your website. Zonda is a WordPress Woocommerce theme designed for online shops. The the theme is fully responsive and retina optimised. Zonda even offer free WooCommerce installation, just in case you’re a WooCommerce newbie! Vellum is a very versatile starting point for virtually any site. The demo (with about 20 variations) shows just how many directions you can take with this theme. Vellum includes a tonne of great features including parallax backgrounds, UberMenu mega menus, Visual Composer content builder, and much more. Great for anything from spas, to musician websites, to wedding sites and beyond. A basic HTML5/CSS3 responsive magazine theme with a built-in review system (supporting both stars and percentage ratings), enabling readers to rate content. This theme is built with Facebook Comments functionality set up. A beautiful responsive theme with WPML already installed, making it easy to translate into multiple languages. This theme’s heavily integrated with WooCommerce, making it a great choice if you’re running an online eCommerce shop. A very simple WordPress theme using HTML5 and CSS3 tableless design. Includes Google Maps plugin, Contact Form 7, and lots of nice little touches like being able to preview over 500 different Google Web Fonts within WordPress. A flat, modern, and responsive magazine theme with a widgetised home page. This means you can feature as many sections on the home page as you like by dragging and dropping them into place in the WordPress widgets editor. Blandes is a creative WordPress theme with hundreds of customisation options. The theme has advanced typography options with over 500 Google fonts, and support multiple header styles, blog types, and portfolios. Lawyers is a premium responsive WordPress theme created specifically for law companies, attorneys, and others in the legal field. The website is professional and slick, and is built on the Twitter Bootstrap framework. The 7 is a responsive theme with an adaptive navigation menu and fluid grid layout. It’s fully customisable with 4 header layouts, 6 skins, 600+ fonts, and unlimited backgrounds. Aware is a clean responsive portfolio theme designed for freelancers, web designers, photographers and videographers. Inovado includes full WooCommerce support, built in mega-menus, video backgrounds, and lots of customisation options. Inovado also comes with layered PSD files for easy editing. Avian is a beautifully designed theme that includes Visual Composer, has a 1-click demo setup, lifetime support, and much more. The Retailer is a powerful theme for building an online store. This theme makes it easy to sell both digital and real products with built-in order tracking, tax and shipping options, and product reviews. Impreza is a stylish and glamorous theme with great attention to detail. With extensive style & colour options, you’ll be able to customise it easily and make it your own. Posh is a great premium responsive WordPress theme that comes with Visual Composer, Slider Revolution, WooCommerce, ShowBiz Pro, Go (responsive pricing & compare tables), Easy Tables, UberMenu, Yoast WordPress SEO, and WPML. Kallys is an SEO-friendly WordPress theme that comes ready with dark/light versions, modern sliders, multiple portfolio layouts, unlimited header and colour options and much more. The theme is coded in HTML5 and CSS3, and includes layered PSD files. Super is an elegant flat WordPress theme with full responsive design. This theme can be used for any type of website, from business and corporate to education and medical. The theme includes mega menus, full width video backgrounds, BuddyPress support, and full width or boxed layout options. The Risen WordPress theme is specifically designed for church websites, although the template could be used for any website that needs a multimedia rich site. The theme includes everything a church website would need, including a mobile friendly sermon archive, photo and video gallery, church event pages, staff profiles, and church news. Warwick is a beautiful magazine WordPress theme with an in-built review system and a huge range of different page templates. While the template could be used for any kind of news or magazine site, the bold design would best suit a website in the entertainment industry. Szia is a clean and responsive one-page portfolio theme built for creative and digital people and agencies. The design is very slick, yet minimal and simple. Medicenter is a responsive WordPress theme designed for websites in the medical and health industry. The overall design is modern, professional, and clean. The theme comes with six pre-defined colour skins, and includes a visual page builder to help you create page templates without having to code. Sahifa is one of the best-selling responsive WordPress themes for magazines, blogs, and news sites. This theme is Apple friendly, and enables users to add an app icon to their iPad or iPhone that launches your site directly in their browser. Sahifa also has a built-in review system, allowing you to add ratings and reviews to your posts. SCRN is an impressive one page responsive portfolio WordPress theme that’s perfect for promoting your work. SCRN comes with a sticky header, a jQuery contact form, lots of short codes, and much more. Mission is a responsive theme designed for charities and foundation websites. This theme includes functionality for donation buttons, event pages, cause pages, staff profiles, and much more. GridStack is a portfolio WordPress theme for agencies, freelancers, and artists. The template has extra-wide and parallax style design, perfect for showcasing photos and case studies of your work. Solaris is an easy to use WordPress theme designed for news website. It has a responsive layout, tiled post page layout, user ratings, and many custom widgets. Town is a WordPress theme built for agencies and design studios to promote their work. The theme uses the Bootstrap framework. The theme is a super fast ajax portfolio, enabling potential clients to browse your work with a beautiful filtering effect. Expression is a powerful WordPress theme suited for photographers who need a portfolio to display their work. The theme is powered by Pexeto Panel, and great attention to detail for making your portfolio stand out. Seashell is a professional WordPress blog theme built with speed, SEO, security, and readability in mind. It’s compatible with WordPress 3.8 and has lots of nice extras like Google Authorship and social sharing integration. Fortis7 is a multilingual ready WordPress theme suited for business websites who want to showcase their work on a portfolio site. The site’s built with KODDE Framework V3 and is very easy and fast to use. Henix is a responsive portfolio and blog WordPress theme designed for agencies and designers. The theme includes lots of handy plugins, such as Mav Icons, Mav Shortcodes, Revolution Slider, Latest Tweets, Wolf Skill Bars, Wolf Message Bar, WP Google Maps, bxSlider, and Contact Form 7. Solido is a beautiful one-page WordPress theme that i’ve used on a handful of sites. It has four different homepage styles, including a video background style, a full screen image style, a parallax image style, and an image pattern style. Feather is a no-frills WordPress theme supporting eight different post formats and lots of styling and customisation options. Porto is a multipurpose responsive WordPress theme with premium sliders, a powerful admin panel, unlimited colour options, boxed & wide layouts, a drag and drop page builder, parallax design options, and multiple header and footer styles. The theme includes Nivo and Revolution Slider, pricing table support, portfolio pages, a functional contact form, and full demo content to help you get up and running quickly. Nexus is a deeply responsive business theme with three responsive sliders and a huge range of skins and colours to choose from. Venda is a professional and and well-designed theme with unlimited custom colour skins and a drag and drop page builder. Venda has both wide and boxed layout options, and has an advanced shortcode generator. Sentinel is a multipurpose WordPress theme with multi page and one page layout options. This theme includes Visual Composer, and has 6+ pre-defined home page styles. Vivacity is an attractive theme suitable for all kinds of websites. It comes with Visual Composer, WPML, WooCommerce, and LayerSlider integration. Nevada is a professional WordPress theme perfect for corporations and small businesses that want a modern but professional design. Vivid is an extremely easy theme to use and is heavily suited around blogging. The theme comes with 15 custom widgets, most of which are directed around social media integration. One interesting addition to this theme is that it includes the Google Responsive Ads widget, enabling your Adsense ads to change in size according to the device they’re being viewed on. Breeze is a great blogging theme with lots of handy short codes and custom widgets straight out of the box. The visual design is simple and to the point, and offers multiple header layouts. Porcelain is a clean fully responsive theme with custom headers and background sections, as well as parallax animations. It has masonry layout support, and AJAX pagination support. Kids Zone is a fun and easy to use WordPress theme designed for kinder gardens, day care, preschool, and other websites designed for children. The theme supports an event calendar, a community forum (Buddypress, bbPress), and has a contact form already installed. Scroller is an elegant WordPress theme suitable for photographers, creatives, and portfolio websites. It has parallax effects, and a one page scrolling homepage. Offbeat is a multipurpose theme built on the Bootstrap framework. It’s relatively clean and simple, but has a nice boxed layout and is well optimised for SEO. Mercury is a great theme that looks fantastic on tablets, mobile devices, and computers. It’s translation ready, includes instant AJAX search, and has online shop support. 3Clicks is a very vibrant corporate theme with 9 different skins, create menu styles, and a powerful admin panel. I’m a fan of this theme, as it’s done a great job of getting the balance right between appearing professional without being overly corporate. ExtraNews is a responsive news theme suitable for publishers. It includes review functionality (with schema microdata integration for showing star ratings in Google search results), as well as slideshows and galleries. 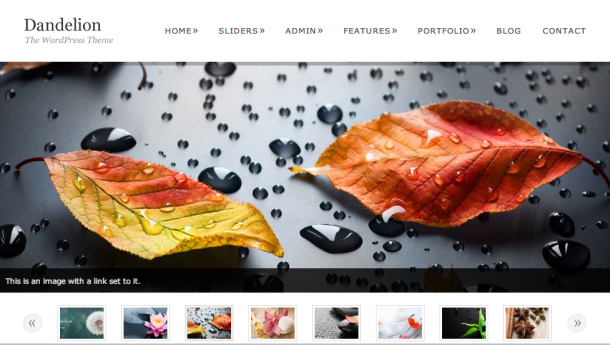 Titan is a photography portfolio theme with password protected galleries, social sharing support, fullscreen video backgrounds, and WooCommerce support for selling your photographs. There are very few themes that I’m 100% content with straight out of the box, but Time is one of them. It’s a beautiful theme with a very professional layout and visual style. You can choose between a boxed layout or open (full-width) layout. The theme is already integrated with maps, and is suitable for virtually any type of site, although I think it’s particularly well developed for a news-based site. Dante is a well-designed mobile ready theme with an easy-to-use page builder, 27 pre-built page templates, and lots of short codes to save you time developing the website. The theme has BBpress and Buddypress support, as well as WooCommerce integration in case you’re looking to build a shop into your website. Munditia is an advanced WordPress shop theme with WooCommerce and BuddyPress support. It has zoom functionality on product hover-over, as well as a well-designed product layout, and wishlists. Astra is a flexible fully responsive WordPress theme developed for businesses and corporate websites that aim to promote a portfolio or specific product. The theme comes with an extensive range of style and colour options, so you can easily customise it to match your brand. Essenza is a beautiful theme with 4 very different visual styles to choose from. Essenza is predominantly a portfolio theme, and supports a grid-based layout for showcasing your photos or creative work. La Bomba is a WooCommerce based WordPress template focused around highlighting fashion trends (the fonts and design are based on what’s commonly used in the fashion industry). The theme includes a lightbox ‘lookbook’, a beautiful parallax background, as well as detailed product description page templates. Cassia is a powerful responsive blog theme with no frills. The theme also supports music posts, enabling you to easily embed music from Soundcloud or Spotify. Groove is a modern and basic theme with WooCommerce integration, WPML, and an Ajax contact form. This theme is built with Bootstrap and includes two premium WordPress sliders. Twish is a theme with an extra-wide layout (1170px), which looks amazing on modern wide screen displays. The theme is built on the Twitter Bootstrap framework and includes lots of demo content (including 26 different homepage layouts). Sportsline is a theme that is, unsurprisingly, designed for sport websites. It has a clean design, and includes page templates for match fixtures, match results, photo galleries and recent news. The theme is SEO friendly, and is powered by Bootstrap 3. Corsa is a beautiful responsive theme with a large full screen background slider. This theme has 3D parallax backgrounds, over 360 included icons, and a huge range of custom fonts to play around with. Barberry is a premium eCommerce WordPress theme with WooCommerce integration and a powerful checkout and my account section. The theme was selected as one of the top ten best WordPress themes by Forbes, and has been downloaded over 500 times. The Barberry theme is built using the Bootstrap framework. Rock4Life is a responsive WordPress theme for bands and artists. It has a filterable gallery, lots of slick CSS3 / Jquery animations, and a HTML5 audio player. Muse is a WordPress theme designed for music lovers, bands, DJs, producers, labels, and event organisers. The theme includes an events template, as well as a photo / video gallery. This theme has a touchable slideshow and is retina ready. IronBand is a theme designed for music and DJ related websites. It has an easy to use control panel, a built-in MP3 player, as well as page templates for gig lists, photos, videos, news, and tour information. Jupiter is a versatile WordPress theme with over 1,600 vector icons included, video background functionality, and a drag and drop page builder. This is the WordPress theme that we used to build the Qosy website. A great photo gallery theme with fluid masonry layout and a 3D slideshow. This theme would be great for photographers, model agencies, luxury retailers, or anything else where the photos do the talking. Hopefully, by this point you’ve found a WordPress theme you like. If you’re ready to get started and get your website live, check out our guide on the 10 best web hosting companies to host your website with. This is a great collection of themes, I appreciate the fact that they have the responsive functionality going on. I loved the themes. I’m trying to mount a site for a social cause and i have no money. What would be a option for me? Awesome collection of premium wordpress responsive themes. I often suggest someone to not spent money on making changes after implementing free themes. But better thing is that purchase a premium theme and take benefits of well tested and nicely coded features. At the end when we compare free theme+changes v/s premium theme then both will have the same amount of money spent. Nice article Marcus. These are some amazing articles! Great job on the list Marcus! Great Job! Thank You, Taylor! And Good Luck! Awesome, WordPress Premium theme collection, I am using another one Named : NiceBird (http://themeforest.net/item/nicebird-wordpress-blog-themes-for-blognewspaper/9477278) I have found some additional features like – by one click you can change the font color and also header style. NiceBird is superb WordPress Theme. This is such an amazing list, everything you can need, even a bit too much!! If I may I would suggest to freelancers out there, think closer about which theme can be used as framework here, to speed up your development process. It’s nice to have beautifully designed theme, but it’s usually a pain to customize it. There are themes, that are flexible and powerful enough that can be used as a base for basically all website solutions. One of such themes is X theme from ThemeForest. All in all, this is a great article I am bookmarking even for inspiration – thank you! This is really an awesome collection of responsive wordpress themes. Love it. I’m looking for inspiration for a new website and this is certainly the place to bookmarrk and come back to when I want to make my final choice! What is the theme of THIS site? Very big and awesome theme collections here. Great job! I wonder if it is important to have a responsive theme? Thanks for the great list. Personally I like Invictus more because of its beautiful design but it’s my subjective opinion and others might prefer Core Minimalist. Amazing collection. I have also used few themes mentioned above. I was looking for the new themes for my website. Then came across your article. Will try out from the list. Thanks for sharing. Wow, It’s a huge collection of premium themes. Those themes are really good quality. Personally, I like Rebound theme for a personal blog theme. However, thanks for sharing this information. I need a WordPress theme for my video tutorial how can I get it, Please add a link here include price. I want to add my youtube video embed code and create the playlist in this theme. It will improve my knowledge in premium responsive wordpress themes.